In the early 1930’s a young illustrator with an uncanny instinct for foreseeing business trends, embarked on a mission. For years he had observed a lack of efficiency in the typical ways businessmen strategized about sales calls - or rather how they failed to employ a definitive effective strategy. Too many sales call hours were wasted visiting clients or potential customers only to discover that the target of the call had moved to another department or was no longer with the company. 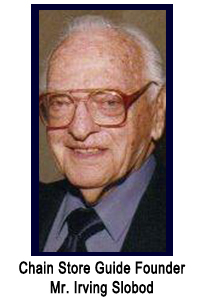 This young man’s name was Irving Slobod and his dream was to produce truly effective business directories. Each directory he decided would ultimately focus on a distinct retail market, listing companies nationwide, broken out by state and municipalities within the state. The idea was to include the company name at the head of each listing, followed by the headquarters address, the number of stores operated, and personnel listings with at least the name of the owner or president. Friends and business professionals warned Irving of the folly of pursuing this dream. The depression was still overwhelming most businesses and Irving was often lectured by the conventional wisdom experts of the day that few businessmen would see the value of his proposition. Irving retorted that in times such as those, businessmen could least afford to do without such a product. He was sure that a good directory would pay for itself after one or two successful sales calls and noted the time that would be saved when salesmen had the means to properly prepare and plan for sales travel and calls. 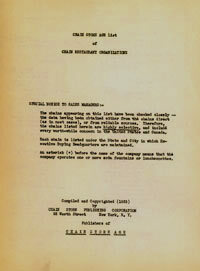 Irving’s first ‘directory’, published in 1933, was called The List of Restaurant Chains. To this day its direct descendant, The Database of Chain Restaurant Operators remains our most popular product. In 1934, additional directories debuted. One was The List of Automotive Accessories Chains. Another was titled The List of Hardware Chains. Eventually these often allied markets were joined in an expanded common directory, The Directory of Hardware and Auto Supply Chains. Years later it was decided that each of these markets was strong enough to have its own stand alone directory. In the meantime increasingly comprehensive directories appeared for Drug Retailers, Supermarket Chains, Department Stores, Discount Centers (which became Discount Stores), Variety and General Merchandise Chains, and real estate based Leading Chains to name a few. New data elements were regularly added as clients made known their needs. From the very inception, all data elements, for the products that began the company that was to become Chain Store Guide, were researched directly by Mr. Slobod, an inveterate researcher. His thorough use of libraries both public and private was legendary as librarians often deferred to his knowledge of their venue. Some even thought he was a fellow employee. His experience with New York’s iconic garment industry led him to personally research apparel retailing by going door to door and up and down stairways through the hustle and bustle of the famed garment district in order to glean the latest data for his growing ‘lists’. Both an entrepreneur and a visionary, Irving Slobod remained with his publications until his retirement nearly fifty years after starting Chain Store Guide. As the company’s nurturing (and sometimes hectoring) presence, Mr. Slobod never ceased to oversee every function of his publishing company, from the hiring of personnel to the setting of type to blazing new trails in market research. Eventually, Mr. Slobod came to the realization that while he was very capable of overseeing virtually every phase of his publishing and research enterprise, proper sales and marketing operations required a broader base. To this end he engaged with friends Godfrey Lebhar and Arnold Friedman of the trade publishing house Lebhar-Friedman to combine operations. 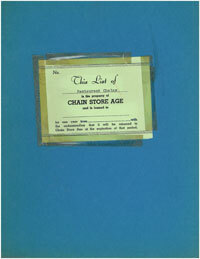 Chain Store Guide became a subsidiary of Lebhar-Friedman, and Mr. Slobod continued to run Chain Store Guide’s planning and operations while Lebhar-Friedman incorporated Mr. Slobod’s Guides to augment their existing industry focused magazines. Through the years Mr. Slobod’s relationship with Lebhar-Friedman became stronger as both companies witnessed cross-brand synergies. A favorite story of Mr. Slobod’s occurred when the editors of Lebhar-Friedman’s Chain Store Age magazine called a meeting to address the new store prototype that seemed to be growing out of the traditional hardware store. It was the post World War ll era and America was witnessing a building boom along with the population explosion. Hardware stores were getting bigger and adding many new products. The editors at Chain Store Age were searching for a term to better describe the new hybrid of a store. Mr. Slobod paused and thought about the popularity this new store was achieving with both consumers and builders and suggested it simply be called a Home Improvement Store. This he then enhanced with the term Home Improvement Center, which is still widely used today. The rest, as they say, was history.